Who says coloring should only be for kids? The Coloring Club MPLS gives artistic adults an opportunity to put their colored pencils to use, which is good for people like Amber (one of our graphic designers) who have “coloring degrees” and want to keep up on their skills. Throw in $5 beers from Eastlake Craft Brewery (the event host) and coloring sheets from local artists and you can’t go wrong. When he was in town last week Vice President Joe Biden had nothing but good things to say about St. Paul’s Union Depot. If that’s not reason enough to plan a visit maybe a little beer might persuade you. This Friday the Minnesota Craft Brewers guild is hosting Winterfest, a tribute to Minnesota beer. Chase out the winter chill with a multitude of Winter Warmers, hearty food, beer education, entertainment and music. We’re all for introducing our youth to engineering, mechanics and hands-on technology. If we don’t who is going to fix all of these old cars we’ve collected? All kidding aside, The Works Museum is hosting a neat family engineering and technology fair offering hours of technology exploration for the whole family. Consider it a good alternative to sitting home on the couch. The icy spectacle known as Red Bull Crashed Ice returns to St. Paul this weekend for its fifth straight year in a row and serves as the grand finale of the worldwide four-stop tour. If you’ve never been it’s definitely something you should check out. 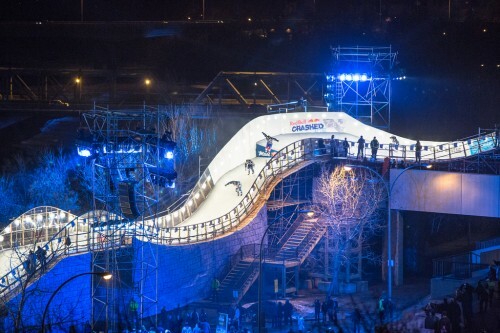 Also be sure to check out the Crashed Ice Village. If you’re looking for easy travel to and from St. Paul Metro Transit will be offering a variety of free shuttles.